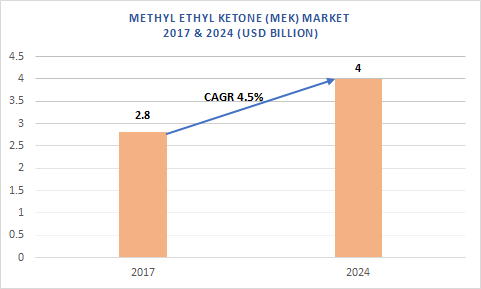 Global methyl ethyl ketone (MEK) market size is anticipated to reach over USD 4 billion mark by 2024 owing to its wide applications in printing inks, paints & coatings, and adhesives. It finds extensive applications in paints & coatings due to its properties like low viscosity, high evaporation rate, and strong solvency. 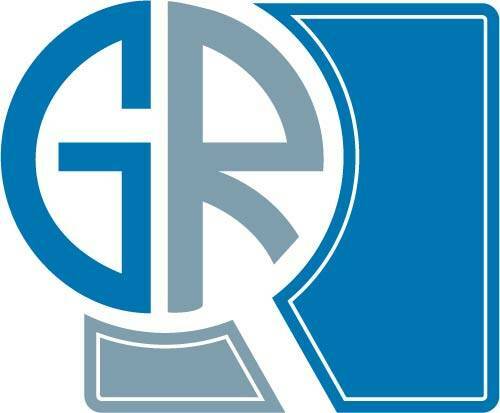 Growing significance of MEK peroxides as catalysts in polymerization of polyester resins as well as a cleaning agent, paint remover, and varnish is expected to drive the industry growth over the coming eight years. Furthermore, it finds extensive applications in printing industry owing to its excellent drying as well as adhesive properties. MEK market size worth over USD 2.8 billion in 2017, is anticipated to reach over USD 4 billion mark by 2024, growing at a CAGR of 4.5% over the period of 2018-2024. Its growing demand in paints & coatings applications due to rise in construction expenditure is anticipated to drive the market growth over the period of 2016-2025. It is also used along with alcohol to produce products like drugs, anesthetics, antiseptics, and lotions. Enhanced crude and downstream supply of petrochemicals is anticipated to boost the MEK market growth over the forecast timeline. However, strict ecological norms addressing heath concerns are predicted to inhibit the market growth. MEK market is segmented in terms of applications and regions. The applications segment comprises adhesives, paints & coatings, and printing inks. It includes solvent-borne coatings, powder coatings, specialty coatings, and waterborne coatings. Growing application of powder coatings in electronics and automotive industries will drive the demand for methyl ethyl ketone. The growth can be attributed to the expansion of construction, electronics, and automotive industries in the Asia Pacific. China and India are predicted to be major revenue pockets of the region. Europe MEK market size is anticipated to surpass USD 650 million by 2024 owing to strict and expensive product registration norms. North America MEK market share is expected to witness a moderate growth over the forecast timeline owing to the extensive use of MEK in paints & coatings along with the heavy focus on sustainable technologies and green solvents. The U.S. is predicted to contribute significantly towards the regional growth over the period of 2018-2024. Key industry players include Shell Chemicals Company, SK Energy Company Limited, Lanzhou Petrochemical Company, Idemistsu Kosan Company, ExxonMobil Corporation, Maruzen Petrochemical Company Limited, PetroChina Company, Arkema Chemicals Company, Zibo Qixiang Industry Group Company Limited, and Sasol Solvents.